Crossing the border from Mexico to Guatemala was our second land border and made the disorganization of Nuevo Laredo, Mexico look smooth and modern. Every day is Saturday and we can decide to play football, bake brownies, or go for a bike ride and the only consequence to not is that you didn’t play football, bake brownies, or go for a bike ride. On the other hand, Claude speaks from experience. In order for anything to get done, you’ve got to do it. You can’t leave the dinner dishes in the sink and hope someone else will do them. And things do not always go as planned. Sometimes there is no water and the dishes have to wait until morning. What follows are some thoughts on how R and I expected to handle the bigger issues we faced - driving, homeschooling, and exercise - and how things have actually worked out. Before we set off on our year long trip, before we had any experiential concept of what life on the road would be like, we set a rule that we would not drive more than four hours in one day and we would not drive consecutive four hour days. The rules were designed to remind us that we were trying to get away from the ‘hurry up’ mentality. We had a year and could take our time. The rules would also help us keep our sanity by getting us out of the van often. After all, we had packed our gear and two kids in 80 square feet and were traveling in hot temperatures with no air conditioning. I thought we would violate the 4-hour rule on the first day when we drove a few miles from Alexandria to Williamsburg (the Route 95 corridor traffic in Virginia can be brutal). I was willing to overlook this, however, as a necessary transgression to get us on our way. Amazingly, that drive took only as long as it should. We took it as a good omen. Saint Christopher was smiling at us. It wasn’t until our first week in Mexico that we violated the 4-hour rule when we tried to go from Monterrey to Guanajuato. After six hours of driving we were still many kilometers (Spanish for miles) from our destination. We had grossly overestimated the speed at which we could travel. In order to comply with our more important rule of not driving at night, we pulled into a place called Santa Maria del Rio just before the road was shut down so the villagers could march through town in a religious parade honoring the area’s patron saint. It was our first taste of the surprises that Mexico had to offer and a lesson that sometimes when things do not go as planned, the new plan can be better than the first. Unfortunately, many areas of Central America and Mexico do not have a Santa Maria del Rio conveniently positioned between destinations and waiting to host a parade and fireworks display to entertain us. 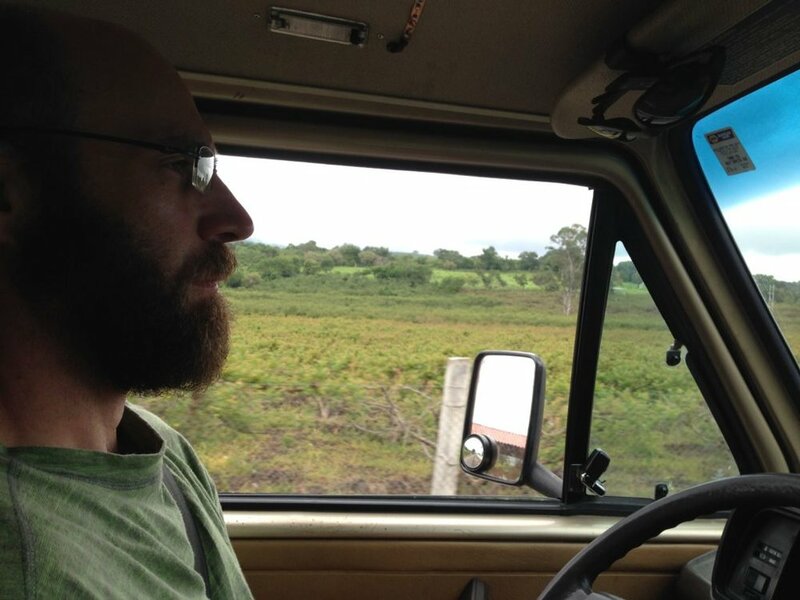 There was a journey in Mexico going from Morelia to Zihuatanejo when we drove consecutive seven hour days to travel 71 kilometers over an incredibly steep, winding, desolate, and pockmarked road in the rain and fog. The few people we saw looked at us like we were out of our minds, which, in retrospect, we were. A collectivo is any shared conveyance and is one of the most common forms of public transportation. 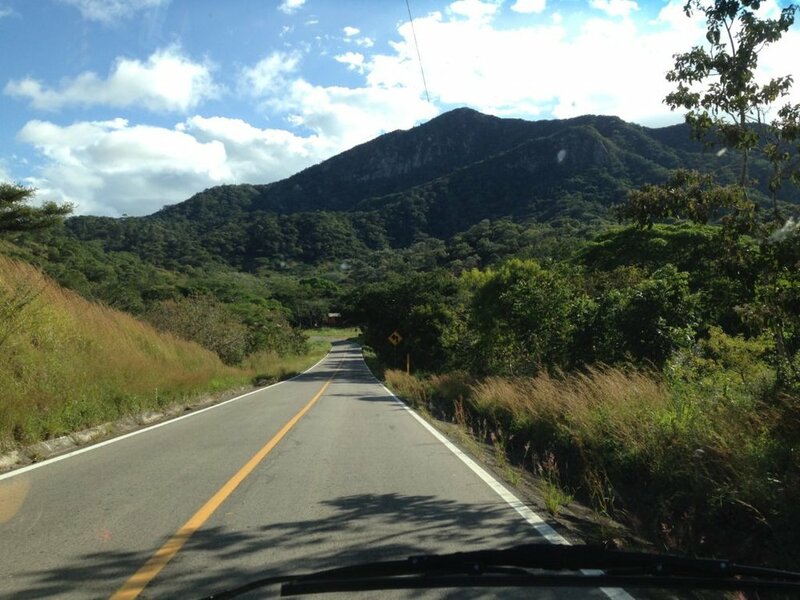 Slowly, we came to appreciate the distances between places in Mexico and Central America, that there are a lot of mountains and that the roads are not always in good or even decent driving condition. We also needed to factor how slow our van Wesley could go. The roads in Honduras surprised us with their good condition. For example, the distance from Chichicastenango, Guatemala to the Mexican border at La Mesilla is 131 kilometers. Maps.me, our GPS app of choice because we can use it off-line, estimated the trip to take 2 hours and 41 minutes. After ten months on the road, we knew better. It took us 8 hours going up and down 3800 meter high mountains (meter is Spanish for 3 feet) and through ramshackle towns with potholed streets. And we were prepared. We had water, fruit, tuna, and a fully charged iPod for R to play DJ. The border between Honduras and Nicaragua was even more informal than the ones further north. Because we do not want to end up wild camping in the dirt along the side of the road (I would be willing to do this, but am outvoted 3 to 1 every time) we now regularly drive more than four hours in a day. While we take precautions to avoid a repeat performance of the Morelia to Zihua drive, we all recognize that long days in the van are necessary. We try to avoid consecutive long driving days, but even that rule has its limits. No one wants to spend two nights in Huetamo, Mexico, waiting for a gang war to break out. The Pan-American highway is the international network of roads that connects Alaska to the southern tip of Argentina and is often a simple two-lane road. 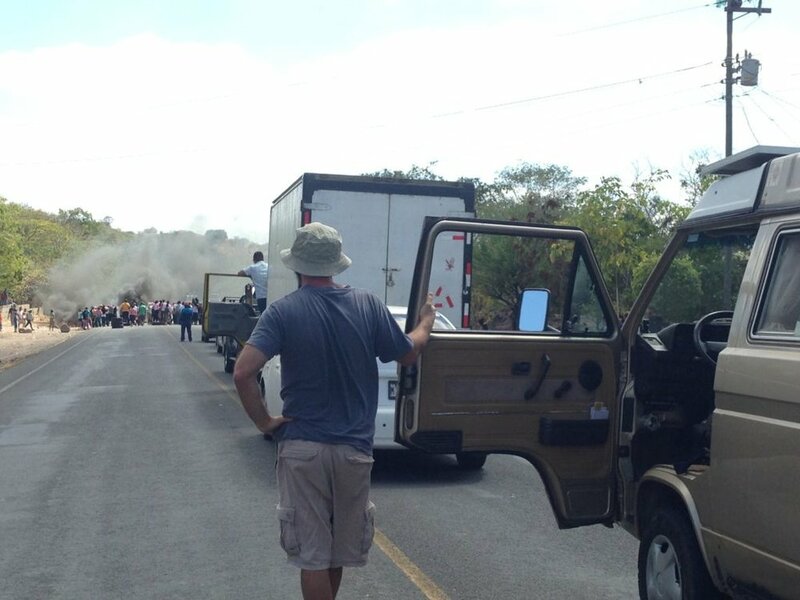 Here, in Esteli, Nicaragua, villagers blocked the highway by burning tires. They were protesting the lack of public health services and mosquito control measures which led to the death of three children as a result of Dengue fever, a mosquito-borne disease. 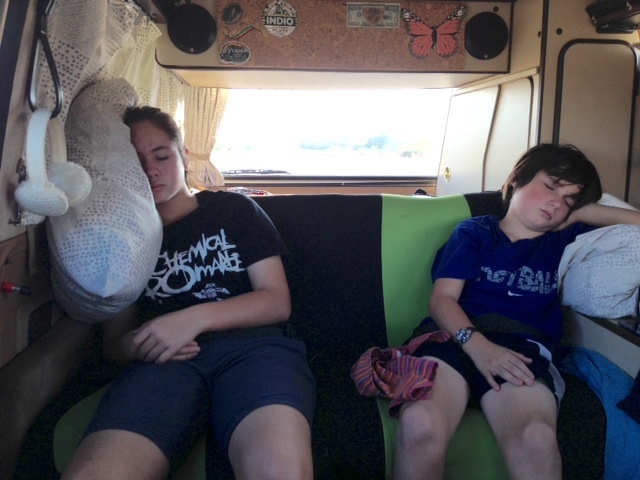 More on our expectations about homeschooling and exercise while on the road, and what actually happened, will be posted soon . . .